"All-natural granola using high-quality fats and sugars." Mix oats, pumpkin seeds, sunflower kernels, sliced almonds, flaked coconut, and sea salt together in a large mixing bowl. Beat coconut oil, honey, maple syrup, and vanilla extract with a whisk until smooth; pour over the dry ingredients and mix to coat. Spread the granola onto the prepared baking sheets. Bake in preheated oven for 10 minutes. Use a spatula to stir the granola, rotate sheets in the oven, and continue baking until golden brown, about 10 minutes more. Let granola cool on the pans to room temperature. Mix wet ingredients with a whisk so the honey and syrup are completely combined. This is important so that the sugars do not burn. Watching granola closely after turning it. Every oven cooks differently. You want the granola to be golden, but not turning brown or dry. Use baking sheets with sides for easy stirring. The granola will keep for 1 to 2 weeks depending on how you store it. We use glass mason jars or craft bakers bags. This recipe is a keeper. 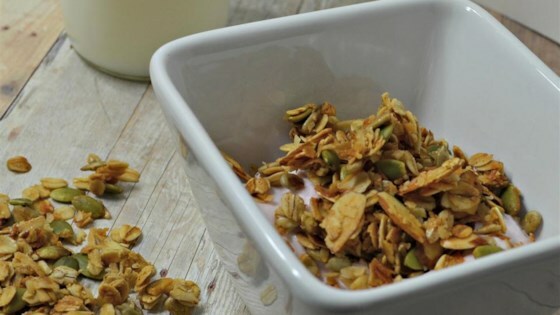 This granola makes a great topping for my homemade yogurt. It even tastes good by itself as a snack.